Teah Selkin and Zoe Siegel acted as conference co-chairs for the student-run diversity conference. Dakota Ridge High School student Jasmine Davis performs spoken word at the 26th annual Cherry Creek Diversity Conference held Feb. 2. CHEER Colorado, an adult cheer group that stunts and performs to raise money for local LGBTQ charities, got the spirit flowing at the Cherry Creek Diversity Conference. The Westminster High School mariachi band was one of many diverse performances during the opening ceremonies at this year’s Cherry Creek Diversity Conference. 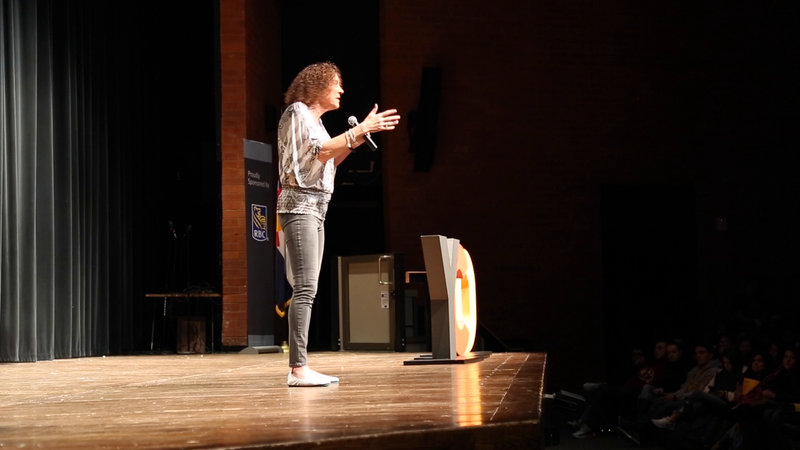 Paula Stone Williams, a transgender pastor and speaker on gender equality and LGBTQ advocacy, addressed students at the Cherry Creek Diversity Conference as the keynote speaker Feb. 2. When Teah Selkin, 18, started at Cherry Creek High as a freshman, she only knew one thing about the school — the common stereotype that Cherry Creek High School is a school for rich, white kids. As a Samoan and a first-generation American with a single mother, she didn’t fit the mold. She thought that in order to fit in, she would have to make a fake persona. But by the end of her sophomore year, she had forced herself to get more involved and realized the school in Greenwood Village was anything but homogeneous. That year, she found the Cherry Creek Diversity Conference, an event designed for students to strategize on how to create a safe and welcoming learning environment across the state’s high schools and communities. Selkin co-chaired this year’s event with Highlands Ranch student Zoe Siegal, 16. Siegal said before joining the conference she had a difficult time expressing herself and showcasing her uniqueness. More than 1,000 teenagers from 105 Colorado high schools and youth organizations throughout the state attended this year’s event, which was hosted by the Cherry Creek School District; organized by Youth Celebrate Diversity, a Denver-based nonprofit organization; and underwritten with a donation by RBC Wealth Management. While most people associate the word “diversity” with ethnicity or race, the conference deals a wide range of topics, including cliques, religion, gender, sexual orientation, physical and mental challenges, multicultural art and music, socioeconomic concerns and teenage social problems. The conference started in 1994 under the leadership of Janet Sammons, now chair of the board of directors for Youth Celebrate Diversity, when 18 schools gathered. Now the conference has grown into the largest diversity event for teenagers in Colorado. Throughout the day, student and adult participants broke out into discussion groups and workshops to address respect and diversity issues in their schools. Among the 42 workshops offered were “Left versus Right: Politics and Diversity,” focusing on providing students with skills and strategies for respectfully engaging others in political dialogue across difference. Additional breakouts focused on religious diversity; sustaining youth activism; understanding immigrants and immigration; and youth homelessness. Dakota Ridge High senior Jasmine Davis said last year was a hard year for her, but when she came to the conference, it was the first time she ever felt like she was accepted, loved and understood. This is the first year the conference was planned solely by students. Another first for the conference was to have a keynote speaker who is transgender. The keynote speech was delivered by Paula Stone Williams, a transgender pastor and internationally known speaker on gender equity and LGBTQ advocacy. Williams’ recent TED talk had over half a million views in its first 48 hours, and her TEDxMileHigh talk on gender equity has had more than 1.7 million views on YouTube. Williams talked to the students about the heroes journey. Williams told the students they have all answered the call by attending the conference and they have the power to create change in their communities.